Mango Airlines flights booked with Nedbank Greenbacks can earn exclusive SouthAfrica.TO travel vouchers to discount flights even more. Email a writeup of your last flight to cheapflights@southafrica.to & you will earn SouthAfrica.TO travel vouchers (the better the quality of the review the more the vouchers). 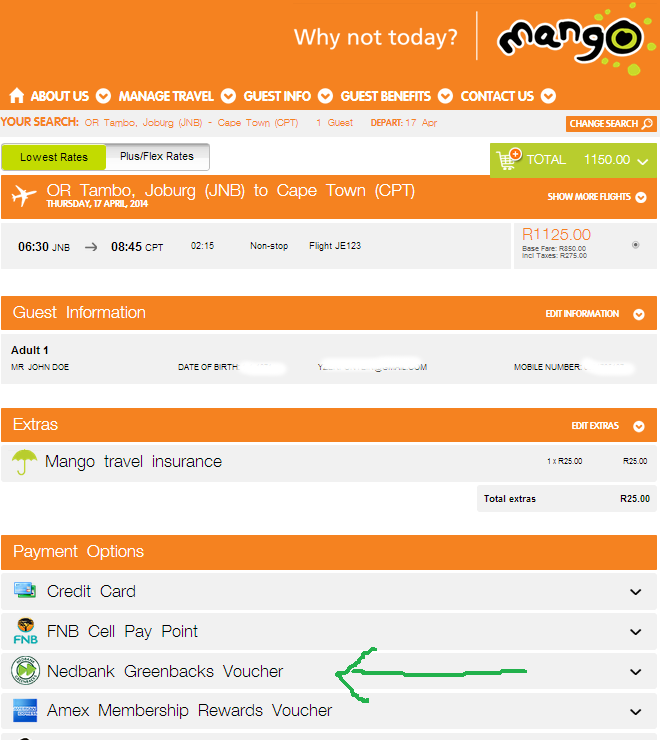 Another way of booking Mango Airlines flights is with Nedbank Greenbacks. Nedbanks Greenbacks can be earned on eligible credit card spend, with a higher earnings rate possible on American Express credit cards. Every R5 of eligible spend on a Nedbank cheque card or credit card earns you 1 GB, or 2 GBs if it's an American Express Cheque Card or credit card. To earn a R100 Mango flight voucher you need 3500GBs, or to have spent R17,500 on a Nedbank card (or R8750 on an American Express card). This means that you're getting some 0.6% back on your spend on a Nedbank card and 1.1% on an American Express card). Mango Airlines are running a flight special where you can book flights until 30 Apr 2014, for travel dates until 30 Jun 2014, with the Nedbank Greenbacks card from R629* for a 1-way trip (that's the lowest fare, it wont be for all dates, or for all routes). By contrast, on a Kulula credit card you earn 3% on the first R5000 spend, 2% on the next R5000, 1% on the next R10,000 and 0% thereafter. This means that if you're spending less than R41,000 per month on your credit card then you earn more with a Kulula credit card, and if you're spending more than R41,000 per month then you're better off with a Nedbank credit card. If you're spending less than R31,000 per month then you earn more on the Kulula credit card than on the American Express card, if you're spending more than R31,000 per month on your credit card then you earn more Mango flight vouchers on an American Express card than you earn Kulula moolah on a Kulula credit card. Kulula has no additional charge to earn Kulula moolah, whereas Nedbank has an annual fee to join the Greenbacks rewards program (R179 p.a. at the time of writing). However, Kulula moolah expires after 6 months. Greebacks never expire, but if you don't use your Nedbank card for 5 months then you forfeit your GBs. The first step to purchasing Mango Vouchers with your Nedbank Greenbacks is to phone 0860-555-111. The conversion rate is R100 for booking a Mango flight for every 3500 Greenbacks. Your Mango voucher is then sms'd to your cellphone. If you are going to purchase more than one Mango flight ticket with your points, then request more than one voucher. Then carry out a flight booking on the Mango website. Select your flight, type in your name, date of birth and phone number; then press continue. Type in your voucher number & click "Add/validate". If you have a VAT number you can also fill it in. If your Greenbacks Vouchers are worth less than the cost of the flight booking, you'll have to cover the difference by another form of payment. Nedbank Greenbacks may also be used to book South African Airways flights. You will need to be an SAA Voyager member (phone 011-978-1234 if you are not yet a Voyager member and woud like to join), as the process involves converting your Nedbank Greenbacks into Voyager miles. Nedbank Greenbacks can also be used for car hire with Avis. Each vehicle category has a different number of Greenbacks points which are required to hire a car for a day. First phone Avis at 0861 113 748 to make a reservation at least 7 days before your vehicle pick-up date, then phone 0860 555 111 and provide your Greenbacks numbers and Avis reservation number. Booking Tsogo Sun accommodation with your Greenbacks involves converting your Greenbacks into Sun Rands (Tsogo Sun's frequent guest program), by phoning 0860 555 1111 - you'll need to be a Tsogo Sun frequent guest. Greenbacks offers package holidays to the likes of Bangkok & the Seychelles, which includes flights, accommodation and airport transfers. To get maximum bang for your Greenbuck, use your vouchers to book Mango flight specials. The airline runs the most regular specials out of all carriers in South Africa, and if you subscribe to our mailing list, then we'll let you know when there are flight specials. Nedbank Greenbacks have been exchangeable for Mango Airlines flight vouchers since February 2009. Mango Airlines have held back from launching their own frequent flyer program, instead choosing to partner up with the likes of Nedbank's program. This avoids administrative costs and complexity, whilst increasing its distribution channels through the likes of Nedbank.